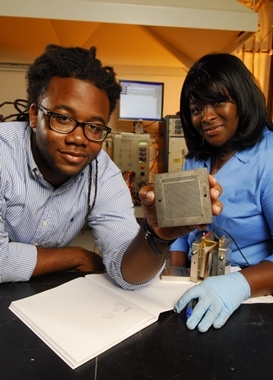 The Woodruff School of Mechanical Engineering has many students who do undergraduate research each semester. Undergraduate research is a search or discovery of new information; an adventure into solving real world problems. Having research experience is critical when applying for graduate and professional schools and is impressive to prospective employers. All students must have a permit to register for research. Contact professors directly to set up a research assignment. You must work out the details including the topic, deliverables, hours, etc. with the professor. Request a permit through the on-line research request database. After all of the approvals are completed, you will be issued a permit telling you the CRN/course to register for. Register for the class before phase 2 registration is over for that semester. Understand if/how the research can be used in your curriculum. Research is a general term, but includes each of the class types listed below. Special Problems are an individual study in certain specialized areas, including mathematical analyses or experimental investigation of problems of current interest. This can include design projects. Special problem classes are 4903 and are taken for class credit. Research Opportunities are independent research conducted under the guidance of a faculty member. Research assignments are 4699 for juniors and seniors and 2699 for freshman and sophomores. Research assignments are taken for class credit. Paid Research Opportunities are research internships. Students are paid for working on a project. The class will be on your transcript, but no class credit is given for this option and no grade is received for this class. Students who received PURA awards register for the paid research class, 4698. Presidents’ Undergraduate Research Awards (PURA) are competitive financial awards given to students who are doing research. PURA either gives students a salary or pays for travel expenses to present research at a conference. Students must apply for PURA awards. VIP: Vertically Integrated Projects unite undergraduates and faculty research in a team-based context. The best way for you to find a research opportunity is to talk to professors directly. Look through the Woodruff School Research Areas and see which professors are doing research that you may be interested in. You should then contact the professor, send a copy of your resume and ask if he/she is interested in sponsoring you for research. Going to see the professors in person is a great idea. ME Students: A list of current undergraduate research opportunities is kept on the web. NRE Students: Talk to your faculty advisor. VIP: Go to the VIP website for a list of the current projects. Go to Georgia Tech Undergraduate Research Website to view institute-wide research opportunities. All ME and NRE research and special problems courses require a permit to register. If you plan to do research for a faculty member outside of ME, you need to contact that department for instructions to request a permit. All ME and NRE research assignments must be submitted by noon (12:00 PM) on Thursday of phase 2 registration. Submissions after this time will not be processed in time and the student will not be able to register for the research class for that particular semester. After the request is processed, students will receive an email with the CRN of the course for which they should register. It is the student's responsibility to register for the course prior to the close of phase 2 registration. All courses are nominally 3 credit hours. For the 3 hour class, students are expected to do 9 hours of research each week during fall and spring semesters, and 14 hours each week during summer semester. Classes for alternative credit hours are permitted and must be arranged individually with the professor. Fall and Spring Semesters: For each hour of class a student must complete 3 hours of research per week. Summer Semester: For each hour of class a student must complete 4.5 hours of research per week. Each course must culminate in a mutually agreed upon set of deliverables which are to be submitted to the faculty advisor for grading. These deliverables can be a written report, an oral presentation, a computer program, etc. All unpaid courses are taken for course credit and are given a letter grade. Multiple semesters of the same research class (ex. ME 4699) can be taken and used towards your degree as outlined below. ME (2011-2012 Curriculum & Earlier): Students can satisfy up to 4 hours of ME Electives with ME 4699 or ME 4903. In addition, up to 6 hours of free electives can be satisfied with 2699/4699/4903 classes from any department. ME (2012-2013 Curriculum & Later): Students can use either a max of 6 credits of VIP courses (ECE 2811, 381X, 481X) or a max of 6 credits of research / special problems courses (2699, 4699 & 4903) as free electives. If doing both research/special problems and VIP, a total of 9 credits are allowed. Research, special problems and VIP cannot be used to satisfy the ME Elective. NRE: Students can satisfy up to 4 hours of technical elective credit with 4699 and 4903 as long as the class is from the College of Science, College of Engineering or College of Computing.